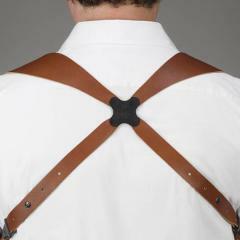 This wide comfort harness is available in tan or black and is ambidextrous. The modular interchangeable component shoulder systems were invented by Galco International in 1969. Today, they continue to offer quality and versatility by developing products that enable you to design the perfect system to suit your needs. For example, you may assemble a two-handgun rig, a half harness system, or add tie downs and cuff case to an existing system. The possibilities are endless. Bought to replace my 14yo one. Perfect replacement. This is the most comfortable shoulder harness Galco makes and may well be the best of its type on the market. Due to its width it evenly distributes the load. Mine was shipped fast and well packaged. The Galco SS2 Shoulder Holster System arrived as proposed, well packaged and made of a fine leather. Would recommend this product to others. More comfortable than the narrow harness which is good when you're carrying the weight of a heavy gun. Does this harness come in extra large? Yes, the part no. is MCHX. Fits chest measurements up to 64".